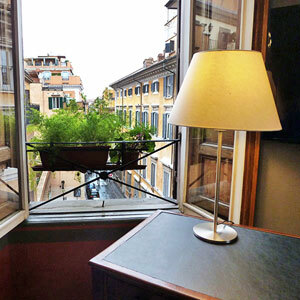 A truly classy and elegant apartment situated in what is known to be the fashion district of Rome. Some of the best boutiques such as Gucci, Prada, Valentino, Armani, Buccellati and Bulgari are around the corner on the famous Via Condotti. In the heart of the historic center, but is surprisingly quiet for an enjoyablly restful night. You are 2 minutes to the Spanish Steps and you are 15 to 20 minutes walk to the Trevi Fountain, the Pantheon and the Piazza Navona. The owner has furnished this apartment with many exceptional antiques to make it the epitome of Italian classical taste. Moda I feels like a home the moment you walk over the threshold. Combine this feeling with the ideal location, and it becomes the perfect home for the discerning traveler who wants to explore Rome in a truly relaxed way and feel like a native while doing so. Enter into the foyer and hallway. To the right is a large living/dining room filled with light from the large windows reflecting natural light off of the light colored painted wood ceilings that are typical of Roman homes. Beautiful antique paintings adorn the walls and a large brightly colored rug covers a wood floor. The dining table can accommodate 8 guests comfortably. This room also has a home theater with surround sound and SKY Satellite TV for enjoying hundred of channels including English speaking movies, US and British News Channels. Continue down the hallway and you reach the first bedroom - twin beds can be joined on request. An adjacent bathroom serves this bedroom. Across the hall is the fully equipped kitchen with access to the second bathroom with shower and double sinks. Next is a small bedroom, best for teenagers as it consists of one single bed on the floor and another bed in a loft reached only by a ladder. This bed is ideal for teenagers or young adults. At the end of the hallway is the master bedroom, a Twin/Double bedroom with en suite bath with tub a dressing area and a balcony overlooking the courtyard. Early arrival fee, before 1 pm is 50% of the daily rate. Children under 12 on request only; must be approved at time of booking.